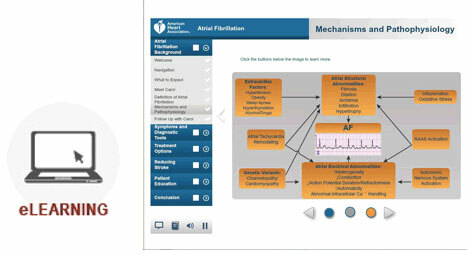 The AHA’s Nonvalvular Atrial Fibrillation (Online) Course is an eLearning course that supports the 2014 AHA/ACC/HRS Guideline for the Management of Patients With Atrial Fibrillation: A Report of the American College of Cardiology/American Heart Association Task Force on Practice Guidelines and the Heart Rhythm Society, which was published in the journal Circulation in March 2014. The Nonvalvular Atrial Fibrillation Course is a self-paced, continuing education (CE) product that requires participants to work through six patient cases with review questions. The course teaches the background, pathophysiology, symptoms, diagnostic tools, treatment options, stroke risks and patient education for atrial fibrillation. After passing the online test, participants can apply to receive CE credits, if desired. The American Heart Association is accredited by the Accreditation Council for Continuing Medical Education (ACCME) to provide continuing medical education (CME) for physicians.The American Heart Association designates this enduring material for a maximum of 1.25 AMA PRA Category 1 Credit™. Physicians should claim only the credit commensurate with the extent of their participation in the activity. The American Academy of Physician Assistants (AAPA) accepts certificates of participation for educational activities certified for AMA PRA Category 1 Credit™ from organizations accredited by ACCME or a recognized state medical society. Physician assistants may receive a maximum of 1.25 hours of Category I credit for completing this program. The American Heart Association is accredited as a provider of continuing nursing education by the American Nurses Credentialing Center’s (ANCC) Commission on Accreditation.The maximum number of hours awarded for this CE activity is 1.75 contact hours. The American Heart Association is accredited by the Accreditation Council for Pharmacy Education (ACPE) as a provider of continuing pharmacy education. ACPE Credit: 1.00 Contact Hours or 1.50 CEUs. Universal Program Number: 0256-0000-14-702-H01-P.*Please be advised, learners must claim CME/CE pharmacy credit within 30 days after an activity concludes. Once the course fee has been received, our staff will give the student a Nonvalvular Atrial Fibrillation: 2014 Guidelines and Evidence-Based Practice Course Key (AHA product 90-1439 through email, phone, or at the facility to be used for online access to activate the course. Upon receipt of your access key code, activate and complete the ACLS course online at www.onlineaha.org, print out your online course completion certificate for your records.